Delightfully greasy. Dang cheap. Literally always open. A people-watching paradise. 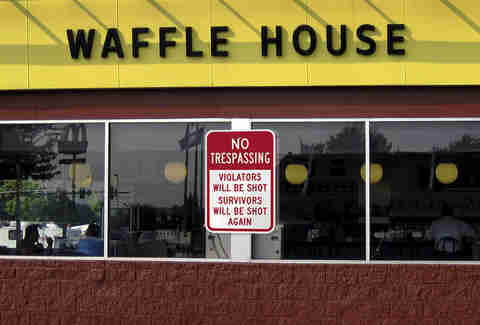 All these terms can be applied to the South's 2a destination of choice, Waffle House. The chain has been cooking for nearly 60yrs, and it has collected quite a few fascinating stories along the way. Read some of our favorites below, then be sure to watch out for elderly terrorists on your next visit (no, seriously). 1. 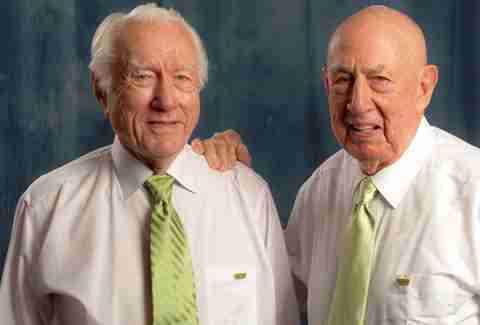 These two gentlemen -- Joe Rogers, Sr. and Tom Forkner -- founded Waffle House in 1955 in Avondale Estates, GA. Before they were business partners, they were simply neighbors with similar interests in breakfast foodstuffs and wide green ties. 2. 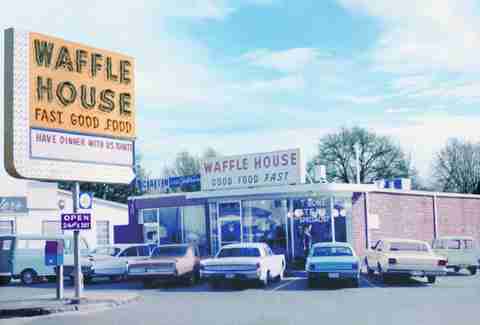 The original Waffle House location (pictured here back in the day) now serves as the official Waffle House Museum, for people who are really into spatulas from the 1950s. BONUS/A CLEVER PLOY AT CHEAP LABOR: you get to make your own waffle at the end of the tour! 3. The pros'll know this one, but the list of Waffle House diner lingo-inspired terms is pretty lengthy. "Covered" is with cheese, "smothered" is with onions, "chunked" is with ham, "topped" is with chili, "diced" is with tomatoes, "peppered" is with peppers, "capped" is with mushrooms, "scattered" is spread on the grill, and "all the way" is something high schoolers traditionally talk a big game about ordering after prom everything, you gluttonous madman. 4. Waffle House is open absolutely every day of the year, including Thanksgiving, Christmas, and other holidays that don't make us feel quite as sad when thinking about people eating waffles there, alone with their thoughts and an old tattered copy of Lonesome Dove in paperback. 5. 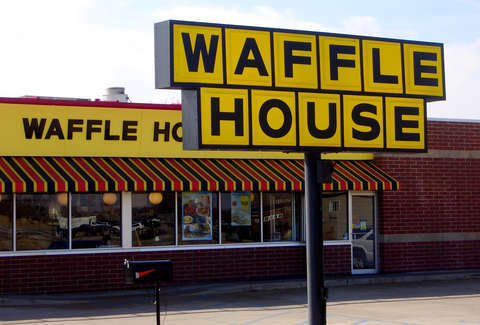 Speaking of holidays, select Waffle Houses get a classy makeover on Valentine's Day. 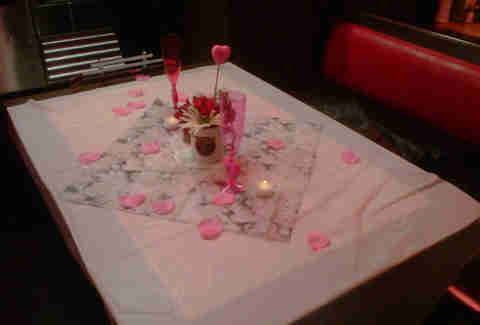 The staff busts out tablecloths and festive decorations for romantic, candlelit meals so your significant other will have no reason to be mad she's eating her Valentine's Day dinner at a Waffle House. 6. Waffle House Records produces chain-themed songs like "Appetite for Life" and "Make Mine with Cheese" for your listening pleasure. This was their first music video, for the hit single "Bert". 7. 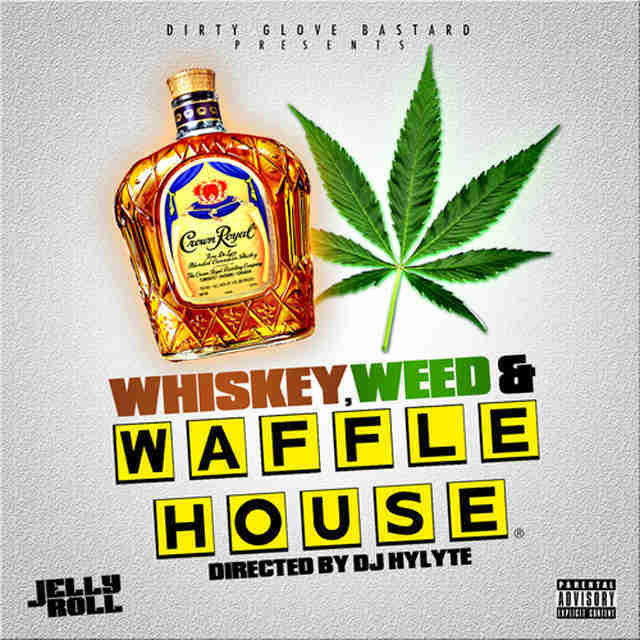 Some rogue rappers make Waffle House-themed music of their own, like one Mr. Jelly Roll from Tennessee. His "Whiskey, Weed & Waffle House" mixtape, released earlier this year, marked a touching ode to his favorite breakfast spot. 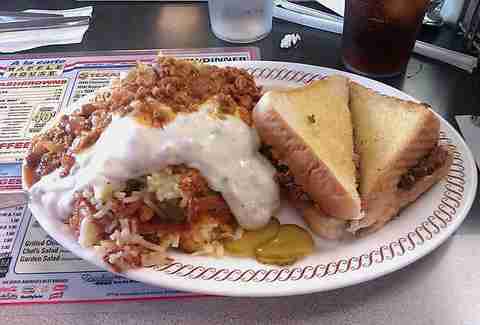 When he's there, Jelly Roll gets an All-Star Breakfast variation: scrambled eggs with cheese; wheat toast; hash browns that're double scattered, covered, smothered, and chunked; sausage; and a chocolate-chip waffle. Oh, also: Jelly Roll weighs 450lbs. 8. 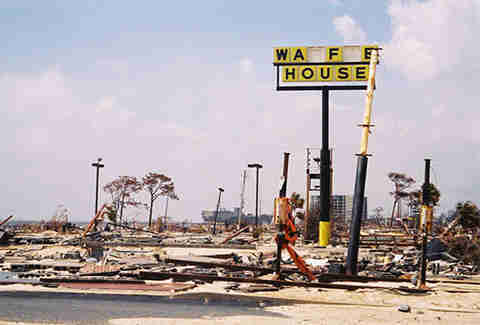 Waffle House is so good about being open all the time, FEMA actually uses something called the Waffle House Index to determine the severity of hurricane damage. 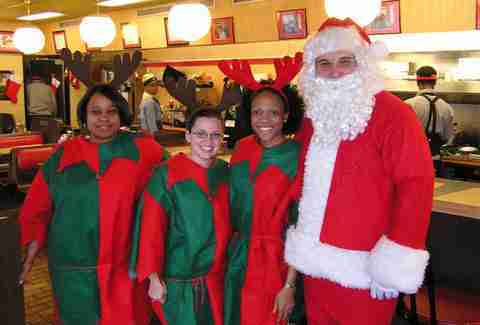 Green means Waffle House is open and running at full capacity. Yellow means limited menu. Red means it's closed, and sh*t is serious. 9. Waffle House plays host to a number of inevitable late-night brawls, but some WH confrontations go way beyond hair-pulling and uncomfortable tickling. When a would-be robber held up the Waffle House that off-duty security guard, Chad Pollard, was dining at, Pollard took out his gun and popped the guy twice. We assume Pollard's meal was then comped. 10. 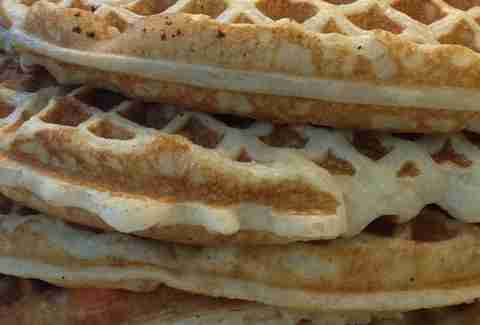 Waffle House has hosted World Waffle-Eating Championships, in which competitive eaters shove as many as they can into their face for $7500. Unsurprisingly, Joey Chestnut won this thing two years in a row, setting a record in 2006 for inhaling 23 waffles in 12 minutes. But dude lost to Patrick Bertoletti the following year. 11. On November 1, 2011, four elderly men were arrested at a Waffle House in Taccoa, GA by the FBI for plotting to assassinate government workers and public officials, blow up government buildings, and mass murder Americans with ricin. 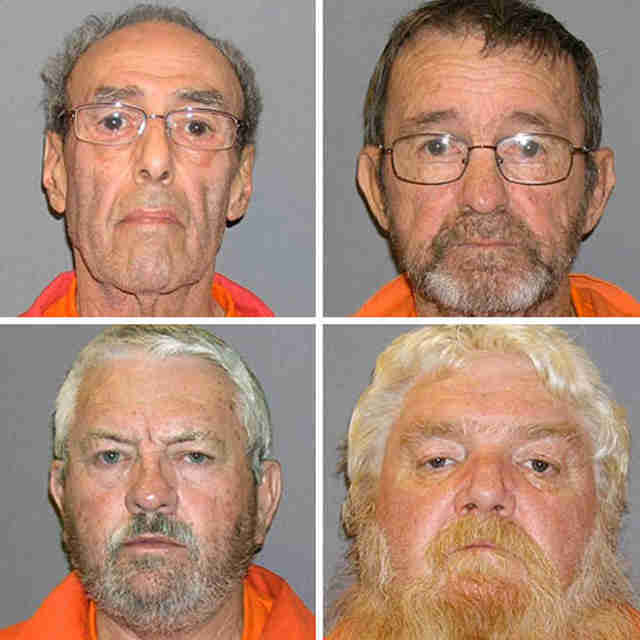 The guys did a lot of terrorist planning at Waffle Houses, and when they were finally arrested they became known as the "geriatric jihadists". 12. Waffle House is apparently responsible for some crazy fetishes, if this hilarious Craigslist posting is to be believed.